Forums can be the most personal of digital social venues, so the team’s goals should be grounded in communicating via interaction rather than words. Usually, this means that they need to build their individual identities, which roll up to the team’s identity. Prepare aims to build these identities by interacting in ways that build the forum’s perception of the team. Build a microsite that describes the forum outreach project and includes the team’s individual contributors. The may be hosted on the brand’s domain or not. Based on the forum members (stakeholders) and their preferred modes of communication, include a combination of text, video, and photos. Explain a few key findings from your ecosystem audit, why you want to empower those shakeholders, and how you aim to do it. Create team avatars that are true to their personalities yet also resonate with the forums’ cultures. Look at their avatars and signatures as culture drivers. For each team member, include links that are relevant to stakeholders. Make sure to include a quote by each team member explaining why they’re excited about the project. Don’t include career links to LinkedIn profiles unless they explicitly resonate with the project. Create team member signatures that link back to the microsite. Do not include any brand or firm information besides the microsite link. Don’t necessarily make the signatures the same exact format. Most forums are “anti-corporate” so if in doubt err on the side of informality. These criteria can vary within the team; choose people that are complementary. Another good criterion is people who are knowledgeable but fairly new employees who don’t necessarily come from competitors. You want people who can empathize with stakeholders with minimal “brand loyalty. In general, do not choose people with marketing or PR backgrounds unless they have demonstrated the ability to put customers first. Do not ask this. Instead, assess their behavior online. Brand “loyalty” is often a liability in forum outreach because it puts the brand’s agenda ahead of customers’/stakeholders’ outcomes, and it will sabotage your team’s credibility. Deepen your knowledge of the forum’s culture. You don’t want to “barge in there” like a bull in a china shop. Expect forum members to be skeptical of your motives. They have likely seen short-lived forum engagement efforts before. If you have lived abroad, pretend that you are in a foreign land, and pay rapt attention to people and culture: how people talk, how they use other artifacts like photos or videos, their language, their habits, and their style of interacting. Encourage team members to share their impressions. Note what other forums or social networks they mention. Search the forum for mentions of your brand and/or products as well as competitors. What is the attitude of forum members toward you and your category? This is useful because it can serve as a baseline. Study the forum’s terms of service. Very closely. Have each team member study it and prepare five questions. Have them do this in isolation to avoid group think. TOSs are cultural blueprints. If theirs has examples or links that exemplify their terms, follow them and study them, too. Judging your products/services solely by how effective they are in empowering users (stakeholders). Give yourself no preference. This can be difficult, so maintain an explicit focus on it among team members. Similarly, judge competitors’ offers according to the sam criteria. Adopt a “hacker’s” attitude to helping stakeholders. This means suggesting different ways to attain outcomes that may or may not involve your products/services, or competitors’. Since you have been transparent with your motives and identity, one of the fastest paths to trust is recommending competitors when it makes the most sense in the context of the conversation. To some marketing teams, this may be heresy, but it’s a concrete sign that you are putting stakeholders before yourselves. Never do this, or anything, as a ploy. Note the most active forum members who are relevant to your stakeholders and workstreams. Be prepared to answer questions about your motives. Lead your team in brainstorming the questions and situations that would make them feel most uncomfortable. Develop little scenarios. Talk through how the situations would confront you. Talk through how team members could work through the situations. This way, team members will gain confidence. This exercise will help them lose their fears. If you have a question about interacting without violating the forum’s TOS, ask an admin or moderator. Since most brands are viewed with suspicion, if you violate the TOS, you will dig a big hole very quickly. Develop the project plan and team member templates, which should contain explicit guidance for each team member’s distinct interactions and how they support the team. The charter lays out explicitly what the project goals are, how the project will be measured, what team-member roles are, and how they all fit together. Each template contains an interaction strategy. When you start interacting, it’s critical to follow the templates because each interaction is defining who you are. After each team member builds an identity within the forum, you can be more flexible. Do not expect a warm welcome or to be noticed explicitly. You will be prepared to set expectations for team members after you’ve done the cultural assessment. After you have been involved in a few dozen conversations, you will have started developing identify within the forum. Each forum is different in terms of how long it takes to develop reputation, both of the team/project and each member. Interactions usually matter more than time. When your team members start feeling comfortable and moving up the hierarchy of social actions, you are ready to build on your in-forum interactions. Each digital social venue has its own hierarchy of social actions. Creating the hierarchy is critical to measuring the team’s progress toward being more trusted. Create your own by reading Using Facebook’s Ladder of Social Actions to Build Community. For even more references, use this search. Take your time. Most of your interactions will be basic until you have earned trust. Each interaction is an opportunity to add value to stakeholders without promoting yourselves, which decreases trust. Team members will begin to know the most active forum members that are relevant to their templates. Experiment with inviting them into relevant conversations. Vote up their interactions when the forum has “thumbs up” functionality. When you do this without expecting anything in return, other forum members will start doing it with you, too. This is a major step up in the hierarchy. Depending on the “density” of interactivity relevant to your stakeholders, add team members. Your team can function as a team, but their vibe should be individual. This means not going out of their way to “build up” fellow team members, as an end in itself. However, when the conversation would benefit from the expertise of a fellow team member, invite him/her into the conversation. Another way to increase the team is by creating new templates that address different stakeholders and/or workstreams. Do not increase the team to the point that you are involved in a very high portion of all conversations. This will not usually be a concern because the ecosystem audit has identified active forums. I only mention it for the cases in which the forum activity may be very relevant but there may be low density. I have seen this in some B2B forums. In most projects, you will have team members rolling in and off frequently, but it’s key to stagger staff changes so there is continuity in the team. That means that new team members will start lower on the hierarchy; however, as your team shows that its mission is true and supportive of stakeholders, new team members will be able to coat-tail on the team’s reputation and earn trust more quickly. Leverage expands the footprint of your interactions outside the forum. This assumes that the forums you have selected are public, which is almost a given because the ecosystem audit cannot consider private forums. With few exceptions, forums are public, even though they usually require users to register as members before they can interact. Many users register with a handle instead of their real names. This is okay as long as the environment is fair, open, and conducive to your culture and goals. Many of the most active forum members will be active in other forums, too, so the first step in sharing links to forum conversations is to share in other forums that share some of the members. That said, make sure you know their cultures; some forums are highly competitive with each other. The DNA here is serving stakeholders while being explicit about how/why you are doing this. For example, when you share links, be explicit about how/why you think the link is helpful to the situation at hand (which is usually a workstream). Serving each other is the ethos of most forums. 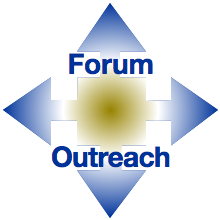 Part of the selection process for forum outreach is how open the forum is. In most cases, when you are true to your mission of serving people without promoting yourselves, forum members will be flattered and enthused when you consider the interactions that you have co-created important enough to share elsewhere. It’s important to hold off on public sharing of interactions until your team is interacting at a fairly high trust level. Your primary goal should be to serve members within the forum. Obviously feel free to share links to forum conversations privately, from the very beginning. Examples are in team meetings and via email. Keep in mind that forum conversations are usually very focused on solving problems or creating opportunities for your best customers. They are often very detailed, and interactions include extensive social information that makes them instantly recognizable and trusted by other stakeholders like the ones in the conversation with you. When your products/services can help stakeholders they will be mentioned or even discussed in detail within the context of stakeholder workstreams. These mentions are more valuable that any marketing you could do—because they are trusted. Share links to forum conversations via twitter, but always introduce them by explicitly saying why it’s valuable, and to whom. The same goes for Linkedin, Google+, Facebook, and others. Forum conversations, because they’re relatively detailed, will be very educational. Have team members share their learnings in blog posts, LinkedIn Posts, Medium or other platform. When people on these other platforms express their gratitude for the link, share a link to that interaction within the forum post. Everyone involved will tend to feel gratitude that their conversation helped other people, too, and they will appreciate you for sharing that with them. When you have been sharing links to forum posts for a while, and you have shared links to the mentions/blog posts, etc. to forum members, consider increasing leverage even more by sharing links on your website, making sure that the cultures don’t clash. An easy way to start is syndicating in Twitter content or creating an RSS feed of your social bookmarking solution. Other things you can try: interview forum members and feature them in blog posts or videos. Many of the most active are knowledge experts who have proven that they add value to your stakeholders. Also invite them to be on your client/customer advisory boards. Only do this if it’s a truly open culture that puts stakeholders first. Forums are the gold standard of building relationships online—because they enable members to support each other while developing trust, relationship, and reputation. Most social media outreach efforts fail because they are thinly veiled marketing tactics that put forum members second to promoting the brand and its products or services. Forum members have seen this before, so they are quite skeptical of firms’ efforts. As the short guide to forum outreach emphasizes, you can succeed by taking every opportunity to show that your primary goal is supporting users. Forums are the most efficient platform available for building relationship, preference, and profit precisely because they are the least promotional digital social venue type. That keeps most brands, i.e. your competitors, away and makes it easier for you. I do not recommend forum outreach projects unless the effort is grounded in serving users. Trust your stakeholders: when your offers support their outcomes and you have a good reputation with them, they will recommend you and buy from you. See The Leap: How Trusting Customers Leads to Higher Profits. To drill down into the larger context of how business is becoming personal, see Personalized Individual Experience.